Dr. Daniel Michelson became interested in Torah codes in the early 1980's after Professor Rips showed him his Torah code work. He wrote a paper about codes which was widely circulated in email form and which appeared in B'or Ha Torah in 1987. His work brought knowledge of Torah codes to many people. In the late 1980's, Harold Gans, then a senior cryptologic mathematician (a code breaker) working for the National Security Agency, U.S. Department of Defense, heard about the Witztum Rips, and Rosenberg (WRR) study and found it hard to believe. In 1990, he undertook an independent evaluation, writing his own software that implemented a protocol almost identical to that of WRR. He obtained nearly the same remarkable results of the association between rabbinic appellations and dates of their birth or death. He then made an independent experiment pairing appellations of the great rabbis used in WRR with the cities of their birth or death. He used a rule based protocol developed by Zvi Inbal to provide the Hebrew transliteration of the Jewish names of the cities, (the names of the cities as they were called by the Jews), that was required for the experiment. His results were even more significant than the WRR experiment. The p-value was 1/166,000. Some people raised questions about Inbal's rule based protocol. Gans then sought expert opinion from rabbis literally all over the world to check Inbal's rules. Gans found, in fact, that Inbal's rules were correct and he found, as well, that there was a name misprint in one the encylopedia sources they used. But to keep the protocol completely a priori, they did not correct the encyclopedia mistake in their city name data. Some years later he redid the experiment using the formula for measuring compactness as exactly as used in WRR. The new p-value was 1/250,000. The paper describing the new experiment was given at the 2006 Pattern Recognition Conference. In the 1991, during the time of the war in the Persian Gulf, soon after Dr. Alexander Rotenberg, emigrated to Israel, he met Professor Rips who told him about the Torah codes. This sparked Rotenberg's interest in Torah codes. Dr. Rotenberg was so impressed, that he decided to check it by himself. Together with his friend Andrey Smirnov they wrote the SofSofTorah program. To this day, this program remains one of the most important tools of the research. They included in this program the kind of statistical calculations Witztum, Rips, and Rosenberg used in the WRR study, but it has many other useful functions thought out and designed by Dr. Rotenberg. This is the program that is the main interactive program used by Professor Rips, even to this day. As well, it was the program used by Michael Drosnin in doing the searches for his second and third Bible code books. Dr. Rotenberg developed his own protocol for Torah Code research. His protocol concentrates on closest meeting and closest pair of ELSs. He has hundreds of examples showing that they are part of the foundation of the encoding. For an application of this principle, he examined key words of some major Torah commentators as they wrote about a particular Torah passage. Rotenberg hypothesized that in or near these passages he would find ELSs of the exact same the key words the commentators used. His book And All this is Truth summarizing many of Rotenberg's findings was published in 2005. 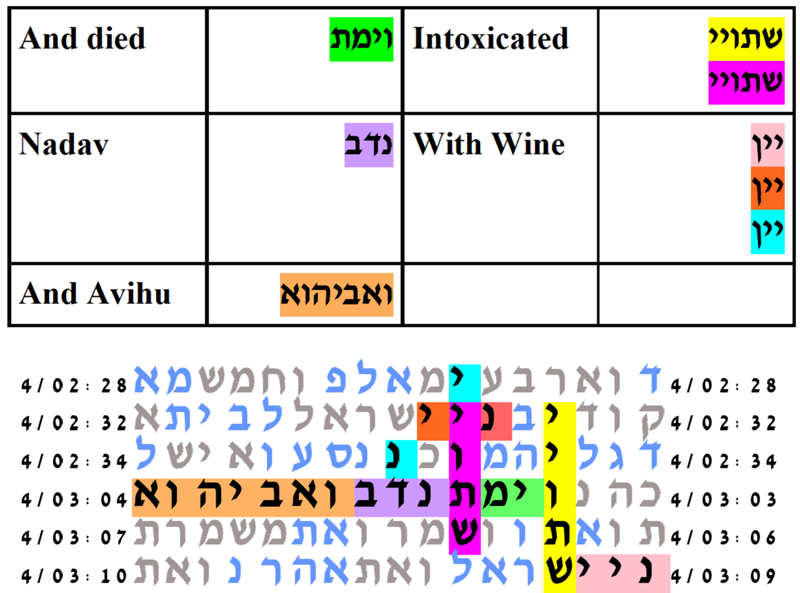 An example table of the kind that Dr. Rotenberg finds is the table below that relates to the verse And Nadav and Avihu died, Numbers 4:3. This is the story about the two sons of Aaron who after the desert Temple, the Mishkan, was sanctified, took a strange fire into the Mishkan. The Zohar (Shimini) in commenting on the verse Do not drink wine or strong drink, neither you, nor your sons with you. (Vayikra 10:8) quotes Rabbi Yehuda. Rabbi Yehuda said that from this chapter we learn that Nadab and Abihu were under the influence of wine from the fact that the priests were warned about it. Interestingly enough, Dr. Rotenberg finds two sets of ELSs of intoxification with wine that cross the verse And Nadav and Avihu died. This is shown in the table below. The ELSs for intoxification are long skip ELSs. The cylinder size is 150. With expected number of ELSs set to 300, the probability that a text from the ELS random placement text population would produce a table with one set of ELSs of intoxification with wine crossing one of the two instances of And Nadav and Avihu died is less than 1/10,000. In the early 1990's Dr. Moshe Katz worked on his own Torah code program and began giving talks on his Torah code research. Dr. Katz was the first person to find the ELS of Yitzchak Rabin's name associated with the nearby key words assassin will assassinate, and communicated this information to Rabin's office as well as the people responsible for his security. His main findings of that period are published in his book Computorah, published in 1996 and it comes with his software. In the early 1990's Rabbi Glazerson and Professor Haralick began working on Torah codes. They published their first book on Torahcodes in 1996. Its title is Torah Codes and Israel Today. The book is noteworthy because it formalized a different protocol than the one used by WRR for Torah codes research. It associated with every Torah code table a measure of compactness which was the length of the shortest length text segment that contained ELSs of each of the a prior specified key words. It also measured the statistical significance of that shortest length text segment by performing the identical search in a randomly perturbed Torah text. The perturbation test favored in that book was the ELS random placement permutation method. This is the method that is used for all studies on this website. Professor Haralick presented two papers at the 2006 International Conference on Pattern Recognition. During this period of time, Torah code research results were often shown as tables which were rectangular windows extracted from the cylinder on which the table was found. Haralick's shortest length text segment was a linear measure of compactness which penalized tables found on large cylinder sizes. Professor Rips' intuition was that this was not a good measure. Therefore Professor Haralick wrote new programs to use the area of the smallest area table that contained at least one ELS of each of the key words as a measure of compactness. All of the tables produced on this website use table area as the compactness measure. Dr. Jeffrey Satinover, a writer on controversial topics, got interested in Torah codes in the mid 1990's and published his book Cracking the Bible Codes in 1997. The book has much information on Torah code history, Rabbi Weissmandel, and the Holocaust. Michael Drosnin published his first book Bible Code on Torah codes in 1997. Mr. Drosnin gets the tremendous credit of making Torah codes widely known and popularizing them. In his book Mr. Drosnin tells about his meetings with important political leaders, the Torah code tables he shared with them and how he interpreted the Torah code tables to make predictions. Mr. Drosnin is the second person who found an ELS of Yitzchak Rabin with the associated key words assassin will assassinate a year before the Rabin assassination. Mr. Drosnin frequently interacts with and consults with Professor Rips. From what he writes in his books, it is clear that he was constantly asking Professor Rips to check his tables, see if he saw anything else in the tables, or give his opinion about an interpretation of his tables. It is no wonder that there are about 70 pages of his book on which the Rips name is mentioned at least once. On some of those page the Rips name is mentioned multiple times. Nevertheless, as we shall see from the statement below, Professor Rips disassociates himself from the book. Professor Rips, made the following statement. While I did meet and talk to Mr. Drosnin, I did not do joint work with him. I do not support Mr. Drosnin's work on the Codes, nor the conclusions he derives. There is an impression that I was involved in finding the code relating to Prime Minister Rabin's assassination. This is not true. However, I did witness, in 1994, Mr. Drosnin find[ing of] the tableaux about Prime Minister Rabin, which now appears on the cover of his book. It is the inference of predictions from what appears to be compact tables, exactly the kind of use of Torah code that Drosnin makes, that is particularly troubling to Torah code researchers. The making of predictions has a logical as well as statistical problem. See Drosnin's false predictions. What was the basis of Drosnin's predictions? He had an initial hypothesis that if he found a relatively compact table, one that in some intuitive sense was unlikely to occur by chance, and if the table had key words that described some future possible event, then the table was predicting the event would occur. There are a few of these predictions that Drosnin would argue in fact happened. There are others which did not. As these events did not occur, he had to revise his hypothesis: that the relatively compact table was only indicating the possibility of the event. Of course the possibility that something might happen is not really any prediction at all, but in 1997 when the book was published, it was a good advertising to get people to buy his book which predicted disasters and catastrophies in 2000 and 2006 that did not occur. Disasters sell. Indeed people did buy his book. This point, that a major event happening implies a relatively compact table but a relatively compact table does not imply a major event is hard for many people to understand. It is not unusual for people untrained in logic to make arguments and mistake the A implies B proposition as equivalent to the B implies A proposition. In short, there exist compact tables having ELSs of key words describing an event, its time and place, that never has happened or will happen. And there is no way to distinguish the compact tables that do correspond to real events except by a proper experiment using a priori key words. That many people do not understand this unfortunately clouds the proper understanding of Torah codes. Now, let us read what Harold Gans and Doron Witztum publicly stated about Drosnin's book. Harold Gans, made this statement. The book states that the codes in the Torah can be used to predict future events. This is absolutely unfounded. There is no scientific or mathematical basis for such a statement, and the reasoning used to come to such a conclusion in the book is logically flawed. While it is true that some historical events have been shown to be encoded in the Book of Genesis in certain configurations, it is absolutely not true that every similar configuration of "encoded" words necessarily represents a potential historical event. In fact, quite the opposite is true: most such configurations will be quite random and are expected to occur in any text of sufficient length. Doron Witztum made the following statement. There is a danger that the entire credibility of codes research will be destroyed. Mr. Drosnin's work employs no scientific methodology. No distinction is made between statistically valid codes, and accidental appearances, which can be found in any book. For example, Drosnin's "code" of the comet Shoemaker Levy crashing into Jupiter is statistically meaningless. Such a code can be found by accident in 1 out of any 3 books checked! The Bible Code did not predict the obvious. Again and again it predicted what no one believed possible and then it came true. This kind of statement is unfortunate because it is easy to produce statistically significant tables based on the kind of topics he has shown in which the key words, "predict," in his sense, something historically incorrect, totally incorrect. This is the reason that proper Torah code experiments must have a protocol and the key words must be a priori key words. On the more positive side, Drosnin is truly devoted to the Torah Codes. He is serious and sincere in his attempts to discover and inform political leaders of potential disasters, by the interpretations he has of the tables he has found. His experimental protocol is not a priori. His intuition about table compactness has has improved with time. Many of the tables in his third book, published in 2010 would indeed have high statistical significance, when evaluated according to standard protocols, assuming a priori key word lists. As a side note, although Drosnin is a good popular writer, he evidently is not a trustworthy historian. His 2010 book has some historical inaccuracies, crediting Professor Rips with discoverying the Bible code (page 9), crediting Professor Rips with writing a codes computer program (page 9) and jointly writing a codes computer program with Dr. Rotenberg (page 205). We have spent more space discussing Drosnin than really intended. But since Drosnin's books are popular, people may incorrectly think that it is methodologically correct to make predictions from Torah codes or people may realize that it is not methodologically correct and think that therefore all the serious work is also not methodologically correct. Thus Drosnin's mistake spreads by association and reflects badly on all serious Torah code researchers. It is for this reason that good communicators must be held to a higher standard.